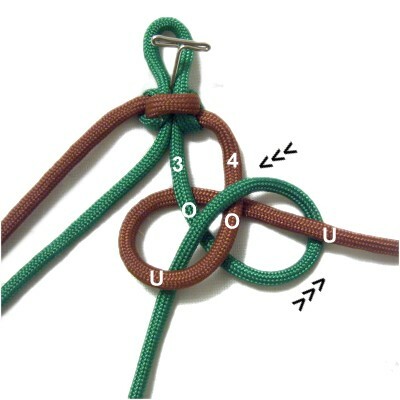 Description: The Mated Snake Knot is related to the Chinese Snake Knot. It features one color along the edges, with the other color in the center area of the sennit. You could use this type of decorative knot for Macrame projects that require a closely woven, sturdy design. It would be suitable for a purse handle, a plant hanger, or a belt. 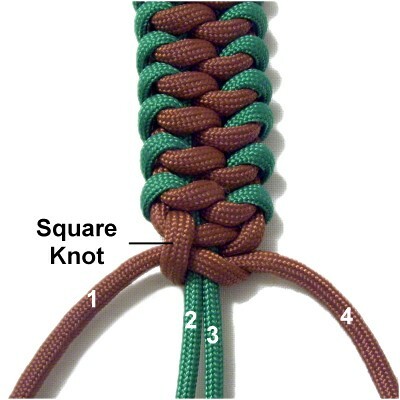 Since it's a thick knot, it makes a great key chain or a simple bracelet. 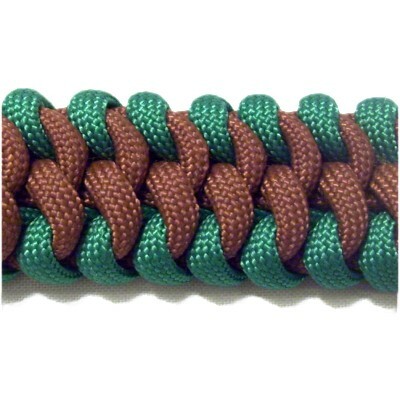 You can use 2mm material to make a Micro-Macrame bracelet or choker with this knot design. In the instructions below, there is a loop that is used to connect the two cords. This is optional if you are just practicing. 2018 Update: Text and images were changed, so contact me if you need the original page. Click on the image or link to visit. 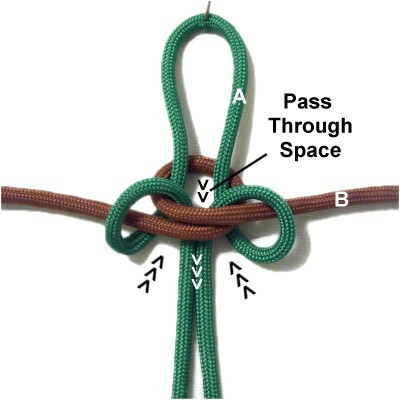 The video gallery contains a wide variety of combination knots and techniques. To practice the Mated Snake Knot you need two cords at least 60 inches long. It's better to use two colors when practicing. When using this knot in a project, the cords should be 10 x the finished length you plan to make. Make cord A longer if you plan to make a button knot for a clasp. Step 1: Fold cord A in half and secure it to your board vertically. Place cord B under it. Cross cord B left over right, resting on top of cord A. Leave some space between the two halves of cord A. 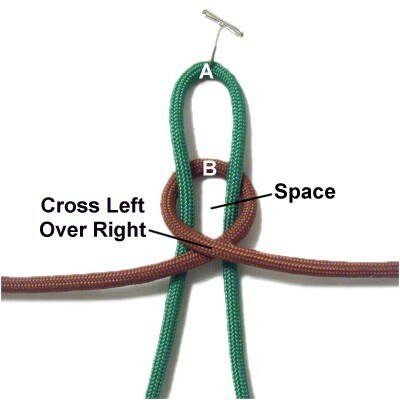 Move both halves of cord A backward, passing over the crossed area of cord B. Pass them through the space, then pull them forward (toward you). 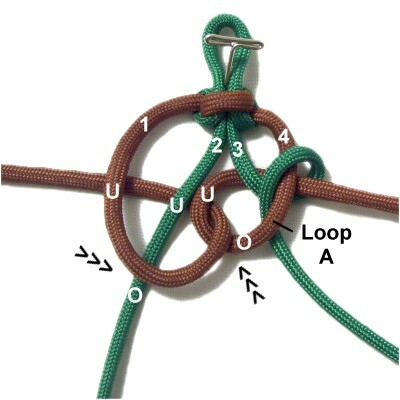 Tighten the knot firmly, adjusting the size of the loop at the top (cord A). Secure the knot upside down if you prefer the back of the knot (next image). Step 2: Mentally number the cords 1 - 4 as if they were separate cords. 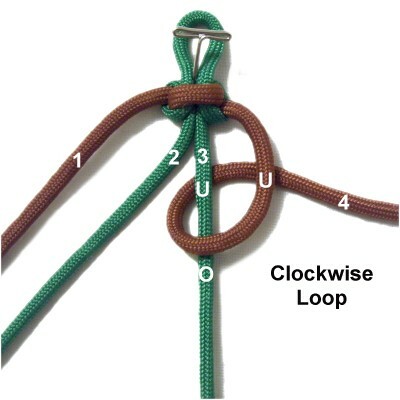 Make a clockwise loop with cord 4, passing it around cord 3 over - under. As you pull it right, pass it under cord 4. Mentally label it as loop A. Step 3: Move cord 3 to the right, passing it under cord 4. Rotate it to the left counter-clockwise, passing it through loop A over - under. Make sure it passes over cord 3 (inside loop A). Mentally label it as loop B. 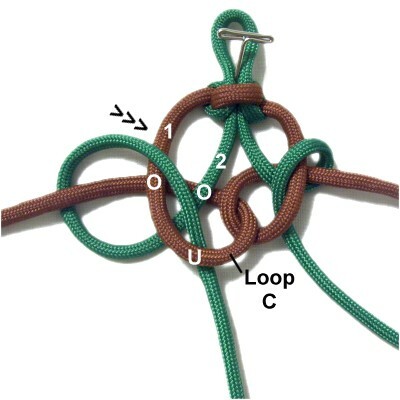 Tighten both loops slightly, but make sure loop A has some space. Step 4: Move cord 1 right, passing it over cord 2. Move it to left counter-clockwise, passing it through loop A over - under. Pass it under cords 2 and 1. Mentally label it as loop C.
Step 5: Move cord 2 left, passing it under cord 1. Move it to the right clockwise, passing it over cord 1 and through loop C over - under. Make sure it goes over cord 2 (inside loop C). 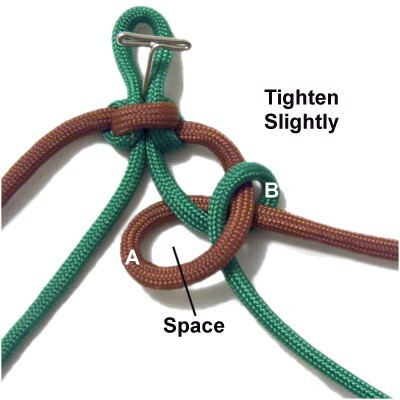 Tighten the first knot for the Mated Snake Knot. Work with the material so there are no twists or kinks. 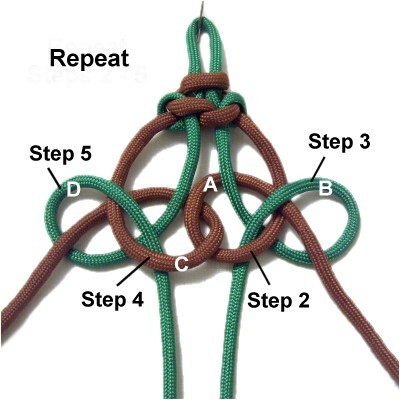 Step 6: Repeat steps 2 - 5 several times, until the Mated Snake knot is the size you need for your project. Step 7: To secure the cords, tie a Square Knot with cords 1 and 4 around the others (optional). 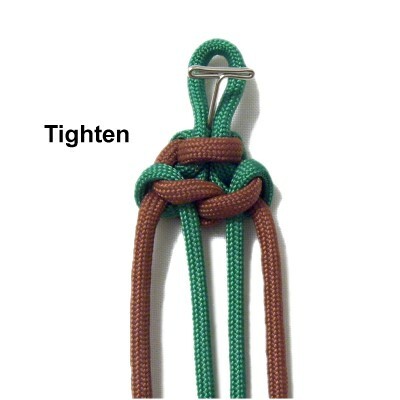 Use cords 2 and 3 to make a button knot if you need a clasp. Have any comments about the Mated Snake Knot? Contact Me.